I have been blogging since the fall of 2004 to express my views in favor of John Kerry and as much against the tyranny of George Bush and his Republican henchmen. @BooMan I considered myself an independent researcher and analyst of politics. In the approach to the Nov. 2016 election, the cross-section of bloggers changed and Democrats were divided in tribes: for or against candidate Hillary Clinton in the primaries. From that time troll rating became a new norm which made writing your view a new adventure. As soon as the Steele dossier was introduced in the media and discussed on the blog, division hardened. My analysis was plenty of skepticism from the start, especially as I started to look at where the dossier was coming from. My view on the matter was not appreciated. Two years have passed and still not all details have come out. Reading this article published by The Hill, I agree with the headline: SHOCKING! This item will be making all the headlines in the coming hours. When the annals of mistakes and abuses in the FBI's Russia investigation are finally written, Bruce Ohr almost certainly will be the No. 1 witness, according to my sources. The then-No. 4 Department of Justice (DOJ) official briefed both senior FBI and DOJ officials in summer 2016 about Christopher Steele's Russia dossier, explicitly cautioning that the British intelligence operative's work was opposition research connected to Hillary Clinton's campaign and might be biased. Ohr's briefings, in July and August 2016, included the deputy director of the FBI, a top lawyer for then-Attorney General Loretta Lynch and a Justice official who later would become the top deputy to special counsel Robert Mueller. Ohr's activities, chronicled in handwritten notes and congressional testimony I gleaned from sources, provide the most damning evidence to date that FBI and DOJ officials may have misled federal judges in October 2016 in their zeal to obtain the warrant targeting Trump adviser Carter Page just weeks before Election Day. Since it was disclosed last year that Steele's dossier formed a central piece of evidence supporting the FISA warrant, Justice and FBI officials have been vague about exactly when they learned that Steele's work was paid for by the law firm representing the Clinton campaign and the Democratic National Committee (DNC). The FBI claimed it was "unaware of any derogatory information" about Steele, that Steele was "never advised ... as to the motivation behind the research" but that the FBI "speculates" that those who hired Steele were "likely looking for information to discredit" Trump's campaign. Ohr had firsthand knowledge about the motive and the client: He had just met with Steele on July 30, 2016, and Ohr's wife, Nellie, worked for Fusion GPS, the same firm employing Steele. And the FBI knew the motive of the client and did not have to speculate: Ohr told agents the Democratic nominee's campaign was connected to the research designed to harm Trump's election chances. Don't take my word for it. Fired FBI Director James Comey acknowledged it himself when he testified last month that the FISA court relies on an honor system, in which the FBI is expected to divulge exculpatory evidence to the judges. The ugly battle of the blogs to get beyond the headlines, to get at the truth! Why belief the work of spooks? My focus was especially on the background of [former] MI-6 asset Christopher Steele [British Orbis Business Intelligence] and his connections with the British spy agency. As expected, the British Embassy in Moscow was a centre for espionage ... what's new? These persons do today what they were qualified for in the years of the Cold War or its aftermath in the years of president Yeltsin. Bringing capitalism to Russia and steeling the state's assets bringing anguish and poverty to its people. Fusion GPS also worked on the Magnitski case and worked for HRC's State Department and Victoria Nuland doing intelligence on Ukraine oligarchs and the Maidan Revolt of 2014. And we learned that Sen. John McCain (R-Ariz.) provided a copy to the FBI [source from Orbis affiliated Sir Wood - Oui] after the November 2016 election — out of a sense of duty, his office says. Emails in 2016 between former British spy Christopher Steele and Justice Department official Bruce Ohr suggest Steele was deeply concerned about the legal status of a Putin-linked Russian oligarch, and at times seemed to be advocating on the oligarch's behalf, in the same time period Steele worked on collecting the Russia-related allegations against Donald Trump that came to be known as the Trump dossier. The emails show Steele and Ohr were in frequent contact, that they intermingled talk about Steele's research and the oligarch's affairs, and that Glenn Simpson, head of the dirt-digging group Fusion GPS that hired Steele to compile the dossier, was also part of the ongoing conversation. The emails, given to Congress by the Justice Department, began on Jan . 12, 2016, when Steele sent Ohr a New Year's greeting. Steele brought up the case of Russian aluminum magnate Oleg Deripaska (referred to in various emails as both OD and OVD), who was at the time seeking a visa to attend an Asia-Pacific Economic Cooperation meeting in the United States. Years earlier, the U.S. revoked Deripaska's visa, reportedly on the basis of suspected involvement with Russian organized crime. "I heard from Adam WALDMAN [a Deripaska lawyer/lobbyist] yesterday that OD is applying for another official US visa ice [sic] APEC business at the end of February," Steele wrote in the Jan . 12 email. Steele said Deripaska was being "encouraged by the Agency guys who told Adam that the USG [United States Government] stance on [Deripaska] is softening." Steele concluded: "A positive development it seems." Steele also asked Ohr when he might be coming to London, or somewhere in Europe, "as I would be keen to meet up here and talk business." So Glenn Simpson of Fusion GPS first build a dossier funded by donors of Florida Republican Marco Rubio to find dirt on primary candidate Donald Trump. After the Republican convention, the dossier was sold to a lawyer representing the DNC and Hillary Clinton. Glenn Simpson had hired Bruse Ohr’s spouse Nellie. Glenn Simpson and Fusion GPS already had ties with the U.S. State Department to work dossiers on Russia related oligarchs in Ukraine. For added “legitimacy” on the Trump dossier for the Democrats, Glenn Simpson hired former British spy Christopher Steele. Steele went rogue [?] and spread the dossier to outside stakeholders: the media, Republican John McCain who in turn forwarded it once again to the FBI. Of course there was no collusion or conspiracy by State institutions to get Hillary elected. Three Russian businessmen mentioned in the so-called dossier of alleged ties between President Donald Trump and Russia scored a legal victory Wednesday when a judge refused to throw out a libel suit they filed against Fusion GPS, the private investigation firm that produced the compilation. U.S. District Court Judge Richard Leon turned down Fusion's motion to dismiss the suit on the grounds that the Russians are public figures and that District of Columbia law contains special provisions limiting lawsuits over political controversies. Leon said the public-figure status of the Russian businessmen--owners of Russia's Alfa Bank -- was open to dispute and could not be properly resolved at this stage of the litigation. Leon said prevailing opinion among his judicial colleagues is that the D.C. law at issue, known as the Anti-SLAPP Act, can't be applied in federal court to force early dismissal of a case like the one filed in 2017 by the businessmen, Mikhail Fridman, Petr Aven and German Khan. The ruling means discovery such as depositions and document requests related to the suit will proceed. Both sides will get another chance to try to prevail in the suit through additional motions later in the process. A spokeswoman for Fusion did not respond to a request for comment late Wednesday. I was waiting for you to post that ... kOMPRoMAT!!MuELler! S.O.MuELler! StOrmy! In the Future, Will We All Be Limited-Purpose Public Figures? Special Counsel Robert Mueller's office issued a rare public rebuke on Friday of elements of a stunning report that alleged President Donald Trump directed his former legal counsel to lie in sworn Congressional testimony. "BuzzFeed's description of specific statements to the special counsel's office, and characterization of documents and testimony obtained by this office, regarding Michael Cohen's congressional testimony are not accurate," a spokesperson told CNBC. The special counsel has never before issued such a substantive rebuke to media coverage. The Washington Post reported: "Inside the justice department, the statement was viewed as a huge step, and one that would have been taken only if the special counsel's office viewed the story as almost entirely incorrect." 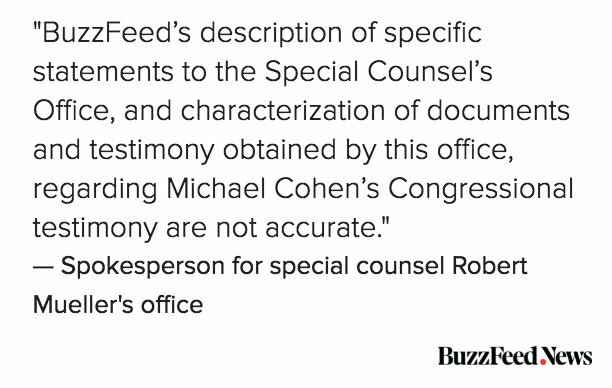 JUST IN: Special counsel Robert Mueller's office has issued a rare statement disputing BuzzFeed News' report that President Trump directed his former lawyer, Michael Cohen, to lie to Congress.